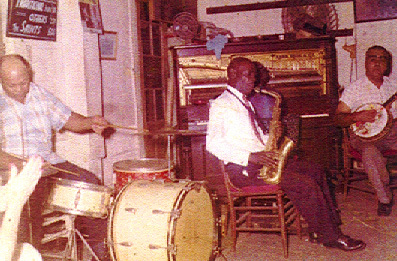 It wasn’t until 1960 at age 60, did Handy sit in on his first recording — with Punch Miller and Paul Barnes. Captain John Handy had always played with great bands that had their music recorded, but Handy was never with any of the bands at the time of their recording sessions. This was unfortunate. But, as late in life as he did get started, he managed to record at least 10 records that can only be found in jazz collector’s personal inventories . 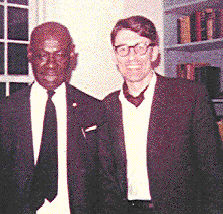 He also appeared in a 1964 Milwaukee NET television broadcast with the Alvin Alcorn Jazz Band. Other recordings were made while he was on tour performing at concerts. 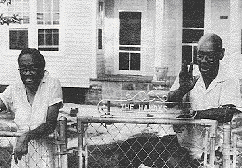 One recording was known as “The John and Mable (his wife) Handy Memorial Album.” He was picked up by RCA Studio and sent on tour through Canada with the Keith Smith American All Stars, composed of Keith Smith from England on trumpet, Jimmy Archey on trombone, John Handy on alto sax, Lars Edegran (a Scandinavian) at piano, Ernie Johnson with banjo, Pops Foster on bass, and Freddy Moor on drums. While at Toronto, Handy recorded with the Claude Hopkins Orchestra, which included Doc Cheatham, Benny Morton, Scoville Brown, Claude Hopkins, Eddie Gibbs, and Gus Johnson. Handy was prompted to let loose with such pieces as Perdido, Handy’s Gulf Coast Boogie, and One o’clock Jump. 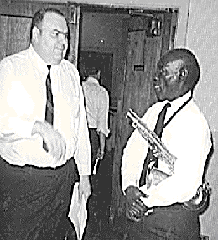 His final televised sessions were with the Preservation Hall Band and the Eureka Brass Band, playing Bourbon Street Parade, – I want a little Girl, – St. Louis Blues, – Lord, Lord, Lord, – Panama, and –Just a Closer Walk, with Louis Armstrong singing. Handy’s style was different. His playing was considered to be robust in nature with his own unmistakable sound. In contrast to other old New Orleans veterans, he was completely sure of his music and his ability. He had a flair for “rhythm and blues,” a style that was later picked up by Earl Bostick and Louis Jordan. His unique musical style was a great influence on New Orleans Revival Jazz and as a trendsetter for Rhythm and Blues. Famed Handy tradition numbers such as Handy's Gulf Coast Boogie and Cap'n's Blues are still played ‘round the jazz-world. Captain Handy's final public appearance of consequence was just nine months prior to his death --- at the very first New Orleans Jazz & Heritage Festival he shared top billing with Mahalia Jackson as noted on the Front Page of the States-Item newspaper for Saturday, June 25, 1970.